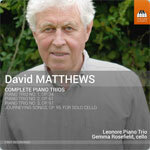 Try the Adagio of Matthews’s Second Trio, of 1993. Over a measured accompaniment on the piano, violin and cello sing and climb and soar; a long glorious melody that simply builds and builds. Its almost Schubertian in its cumulative poignancy. Matthews is a romantic. You don’t have to read the booklet-notes (in which he explains that he conceived the piece as a memorial to a loved one) to sense that. True, that movement isn’t entirely typical. Matthews tends, like Haydn, to write concise, energetic movements, crammed (again, like Haydn) with ideas. And again, you don’t need to know the specific sources of his inspiration – which range from a West Highland seascape in the Second Trio to a deadpan portrait of Hans Keller in the scherzo of the First – to respond to this music. It rewards repeated listening, with Matthews’s lyrical gift never far from the surface.